Sony RDP-XA700 review | What Hi-Fi? Unlike an increasing number of AirPlay speakers, the Sony RDP-XA700iP has decided not to turn its back on the physical dock. Instead, it provides it in a convenient ‘hideaway’ format, so with one press on the silver Sony logo on the front of the speaker, the 30-pin dock appears (meaning iPhone 5, iPad 4 and new generation iPods will need an adapter). Push it back and it’s hidden away from view, keeping the dock’s smooth tapered lines uninterrupted. This is a neat way of sitting on the fence between the two – it’s just a shame a rubber rest for when an iDevice is docked blemishes the front of an otherwise good-looking bit of kit. On top of the dock you’ll find all the controls you’ll need, including the power button, buttons for switching between the iPod dock connection and the 3.5mm input around the back, a play/pause control and a volume rocker. There are also LEDs for letting you know when the dock is connected to a network and when AirPlay is up and running. A small remote is included with basic controls, though if you’re using AirPlay regularly, you’re unlikely to find use for it. Sony is joins the growing list of manufacturers producing their own app to make the AirPlay setup process hiccup-free. Once you’ve downloaded the free D-Sappli app, you simply dock your device after and follow the on screen instructions to get it up and running. The app also provides other features, including EQ settings (when the device is docked) and a clock/alarm function. 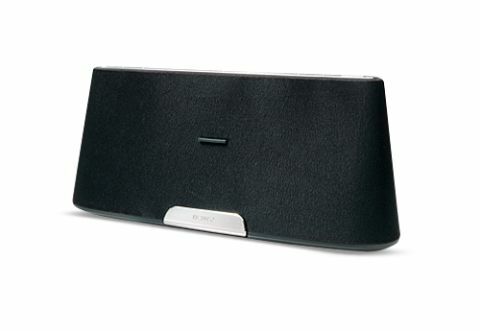 Unlike its big brother, the Sony RDP-XA900iP, the Sony XA700iP doesn’t offer Bluetooth connectivity alongside AirPlay, so wireless playback is limited to iOS devices – though that’s pretty par for the course on most AirPlay docks. As such, this isn’t a dock we’d recommend for non-Apple device owners, though there is a 3.5mm aux input on the back in case it’s needed. When it comes to performance, the XA700iP is a bit of a mixed bag. Listening to Human by The Killers, it’s clear the strengths of this dock lie in the midrange, with Brandon Flowers’ vocals sounding crisp and detailed. Considering small docks have a tendency to be a little light on bass, Sony has managed to pack a serious punch into the XA700iP’s low-end, and while it can sound a tad ‘tubby’ at higher volumes and lack the definition that some rival docks such as the B&W A5 offer, at this price it wins points for a bass that’s weighty and substantial. This also helps the Sony XA700iP to sound larger than its size, though its 60W output is probably still better suited to smaller rooms like a bedroom or kitchen to get the best from it. If lashings of bass aren’t for you, the EQ settings available via the app can go some way to toning it down a bit, and we also thoroughly recommend running this in for 20+ hours in order to get the best results. The dock sounded a little bright out of the box, but running it in overnight much improved this, meaning this is a dock you’ll likely find gets better with use. At Sony’s RRP of £400, we’d say there are better docks out there for they money, but with a quick search online found it more than £100 cheaper, it’s a much better deal. It can’t compete with some of the more powerful, more expensive rivals such as the B&W A5 and Loewe AirSpeaker, but for under £300 this is a well-built, strong performer that’s certainly worth a look in.